This week on “Gotham”: Bullock’s past comes back to haunt him, Montoya and Allen build their case against Detective Gordon, and Oswald comes home to his mother. “Happy Halloween!”, is what “Gotham” seems to say on this week’s creepy episode. A murderer named “The Goat” returns to Gotham…problem is, Bullock killed him ten years ago. “The Goat” hunts down the first born of Gotham’s wealthiest citizens and makes them victims of ritual-murders. Pretty spooky right? Well, not really. While the premise of the story was very fitting of the show’s style, the execution was sloppy. “The Goat” wore a ridiculous burlap mask, had an undeveloped motivation and was subject to an absurd twist. While the plot this week was lacking, this episode made some great strides in character development. “Spirit of the Goat” was very successful in presenting new facets to the characters we have become invested in, while also expanding on smaller characters. Harvey is clearly the center of this episode and we see a very different side of our cynical detective. Bullock struggles as he comes to terms with the return of “The Goat”, the case that left his previous partner (Detective Dix) in a wheelchair. In a moving moment between Gordon and Dix, the old detective tells Gordon to watch out for Harvey, saying that Bullock fancies himself as a “white knight.” This description does not fit the Harvey viewers know from the last five episodes. In a subsequent scene, we discover Bullock has been covering Dix’s medical bills. These two scenes in conjunction make a very profound statement: that behind the cynicism and the corruption, there is a good and caring man. No doubt the show will slowly polish this dirty detective and truly make him Gordon’s right hand. Up until this point we have not actually seen the interaction between these two characters, despite understanding that they are close. As this episode shows, perhaps they are a little too close for mother and son. The relationship is akin to Norman/Mama Bates, as is evident when Mrs. Cobblepot enters the bathroom while Oswald is bathing and proceeds to wash him with a sponge. 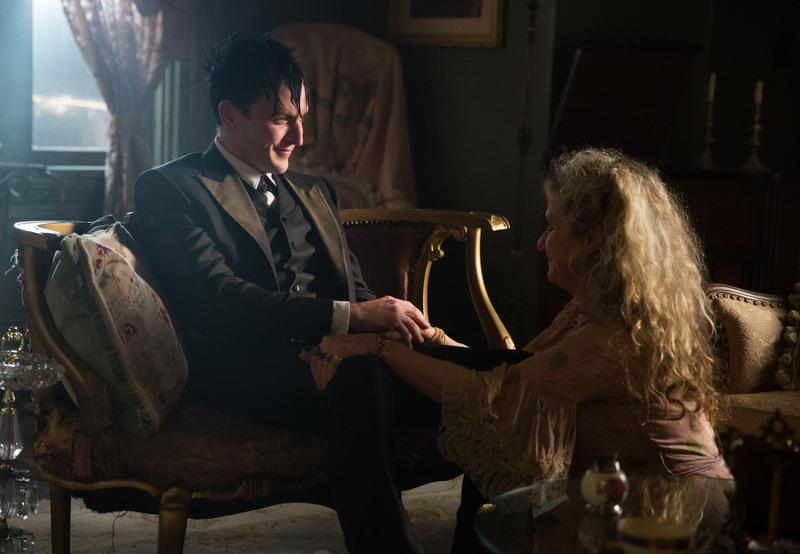 Mrs. Cobblepot is clearly an over-protective mother, which maybe why Oswald feels that he needs to prove that he is capable of great things (at least to himself). Either way, it seems that at some point Oswald will have to “remove” his mother in order to develop his criminal ambition. Thus far Nygma has been one of the most underdeveloped characters. He has had little cameos in various episodes, throwing riddles around and annoying the detectives. This episode we got an interesting side of the future Riddler: Edward has a crush. Nygma tries to impress the “odd girl” at work by re-organizing her filing system. When she discovers this, she becomes furious, leaving Nygma confused. Here we begin to see the origins of the Riddler and his disdain for society. His intelligence and compulsion to categorize ostracizes him from even those who are similar to his personality. “Gotham’s” Nygma is a man who feels completely isolated from society. From here, the road to insanity is not far. While the plot was weak, many characters had important and profound development. I feel this is a repeating trend with the show: wonderful and dynamic characters, with a generic plot. Next week’s show seems hopeful, as another Batman villain comes to town…Victor Zsasz.